I am home! I arrived late last night from my pilgrimage to England and Scotland. Next week I will write about this wonderful trip. BUT since I knew time would be very, very short I asked one more dear friend to guest post for me today. Today my blogger friend, Clella Camp, joins us. I met Clella the first time at the Florida Christian Writers Conference. Now she is one of my best friends! We are part of an online writers group called the KindredHeart Writers and help each other through sharing resources, encouragement, critiques, and prayers. I love how Clella takes everyday blessings and sees God. She writes with such wisdom and clarity. You can check out her blog, Clella’s Corner, and be sure to see her book available there too. I heard them even before I stepped out the door. The honking grated on my hearing aids somewhat like chalk on a board. Shading my eyes toward the sunrise, I could see the black V formation gliding across the dawn of the October morning–geese flying south. As I head back home, I think about the geese and how they naturally fulfill the laws of nature. As they move toward their winter home in systematic V formation, I observe the command that all things be done in decency and in order illustrated against the rays of the morning sunrise. Why do they fly far enough apart that they have the ability to watch each other and communicate about possible landing locations? The geese know instinctively how close they need to be in order to communicate. 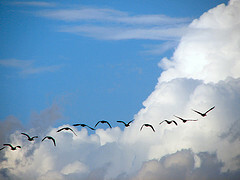 That strange grating honking noise warns their fellow flier about a safe landing place below or that one is in trouble. Communication between God’s living creatures seems to be ingrained in animals as well as human beings. And when the lead bird gets tired it moves to the back and a new bird moves up to be the leader. What makes them know to do that? Why are geese so loyal that they usually mate for life? A family group stays together even within the flock. And if a flock member becomes injured or strays away, some of the family members will go down with the injured bird to keep it safe while it recuperates. My Internet source indicated that only when the bird is ready to fly again (or dies) will they leave, looking for a new group to join. They instinctively know that they need one another to accomplish a goal. Letting the tired leader move to the back is not something they argue about; it is a natural change of leadership. Each member of the flock has its place and naturally realizes when it is time to move up so that the group might function more efficiently. I walk along the edge of the water and watch as the beautiful birds rise again into the southern sky. Nature repeats itself year after year. It is an unending cycle. And only His people can’t seem to learn the pattern He has set for us. The birds do quite well. I pray that I might learn from the geese as I turn the corner to head towards home. Help me to be aware when my friend has fallen. Make me loyal to my mate, my family and my friends. Give me the wisdom to recognize God’s plan for me.